Coffee Table doubles as a Foosball Game table! 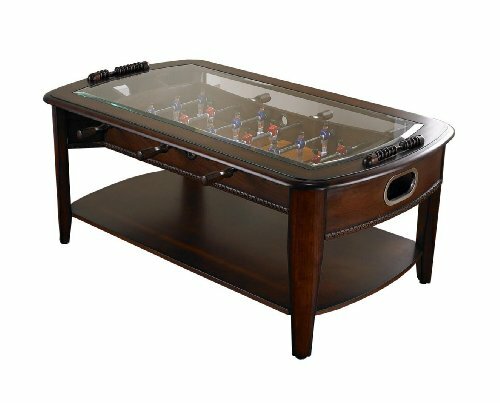 This Foosball Coffee Table is perfect for a man cave, game room, or living room. Made with quality, fine furniture grade craftsmanship, it features attractive accents and detailing that blend into just about any decor. There are a red and blue team, each controlled from the sides by 3 separate wooden handles. When someone scores, the balls are returned through a stainless steel ball return and are put back in play through slots of either side of the table. Score-keeping is easy thanks to the wooden scoring beads located on either end. Being a functional coffee table, the game is enclosed with a glass top, making the game table suitable for placing drinks during game play. Though, I imagine they’ll get knocked off if the game gets too heated. So, ditch that boring old coffee table in your man cave and replace it with this awesome foosball coffee table. Why? Because it’s freaking awesome, that’s why!!! Oh yeah, it goes without saying that every fraternity in the country should have one. Dimensions: 47 5/8 inches long by 28 inches wide by 20 inches. Perfect for when you’re tired of XBox or beer pong.